This evening we held the third episode of the AggroChat Game Club where we talk about my pick the early access rogue-like Darkest Dungeon. I personally chose this game because so many of my friends had been talking about it, and purposefully delayed playing it in the thoughts of this eventually becoming an AggroChat title. The result is that each of us played the game slightly different, and walked away with a very different perspective and feeling about the game. Some of us loved it, but even among those that loved it… we brought with it a completely different outlook and as such a different reaction. Of course some of us absolutely hated the game, enough to actually Alt-F4 out of the window. The end result however is what I feel like our most successful game club title to date, because it certainly spurred on some conversation. Next months title is announced towards the end of the broadcast and I am sure it will be an equally interesting discussion. So apparently it was a good idea to not tag along for this game, didn’t sound like I would’ve enjoyed it at all I think. Too bad I only own Shadowrun Returns (and not Dragonfall), which I started but didn’t play for very long – but maybe I should give it a spin again anyway. 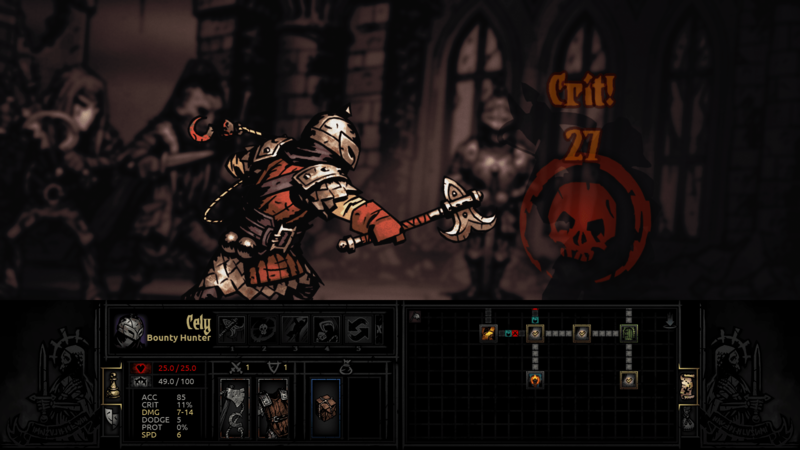 I love Darkest Dungeon and have in fact just downed the Necromancer Lord with my A Team of level 5’s . I find my best mix follows standard MMO tactics – Tank, Off Tank, Ranged and Heals so I used Crusader up front, backed up by a Hellion, Highwayman for Ranged and Vestal for healing. The three damage classes all have good AOE skills which can clear most mobs within 3 rounds.